Please use this form to order the CAMWS memorabilia listed here. CAMWS members can also use this form to subscribe to a number of journals (other than Classical Journal). 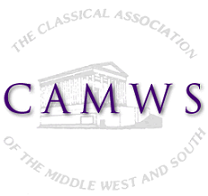 If you are not a current CAMWS member, please use this form: https://camws.org/membership/memberinfo. Payment can be paid by check via groundmail or online by credit card or Paypal account. All online payments for this site are handled by Paypal.com on a secure server. (For more information about the safety and security of Paypal, please follow this link.) A non-refundable handling fee of $3.00 will be added to your order to cover the fees for this service. All prices include shipping within the United States and Canada. When you click 'submit' you will be taken to your cart, where you will have an opportunity to review your choices before checkout. On checkout you will be asked to give a billing address and pay by check. The option to pay using Paypal instead of check will be offered only if you check 'I wish to pay by Paypal' below.